There is the usual irony. WUWT, a blog that specialises in climate disinformation, had an article about accuracy and trust in science (archived here). On the same day, it published yet another grossly inaccurate article by Albert Parker aka Alberto Boretti about sea level (archived here). And it also had an article by Anthony Watts (archived here) about a dip in total solar irradiance - of around 1 W/m2, out of 1360 W/m2 - with Anthony writing: "If nothing else, this demonstrates that sunspots can have quite a large, if only temporary, forcing on TSI and Earth’s received energy budget." Yeah, right. A huge temporary forcing, isn't it. About 0.074% large! Jim Steele has been busy misrepresenting Kevin Trenberth (archived here), who has taken over as his new target after he's run out of equally wrong things to complain about Professor Camille Parmesan. While Anthony Watts, who would never have heard about photosynthesis except for the scientists whose work he rejects, is writing wrong headlines about the impact of CO2 on crops as the world warms (archived here). That's a good topic for another article, but it will have to wait. Oh, and I nearly forgot to mention, Chris Horner of CEI has taken more time off his endless pawing through FOI'd emails from other people to moan about the fact that there's a subpoena out for documents from CEI itself. I think someone was also complaining about the government consulting with environmental groups instead of with ALEC (or CEI), which usually run the show. You can treat this as an open thread to comment about anything you like. You wanna see something scary? 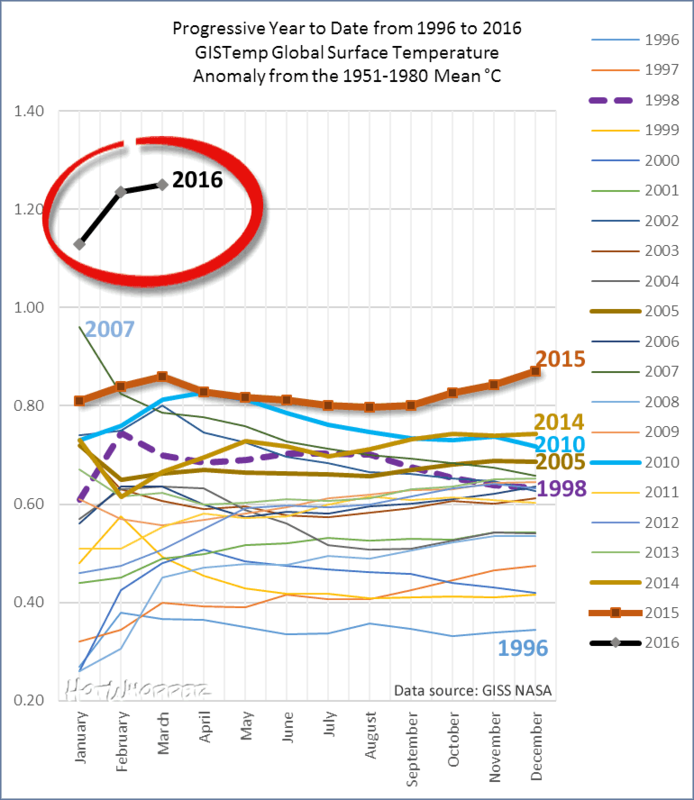 Graph annual GISStemp, but include a point for 2016 YTD. Jaw-dropping. Agree. This is the progressive year to date. Each month's data point is the year to date average up to the end of that month - from the March update. There's a new video narrated by Lindzen making the rounds. I think his points could have been made ever so much more effectively and accurately had he been smoking one of his nonharmful cigarettes in a room where workers in hazmat suits were taking nonharmful asbestos out. But maybe he knew that would be a little too accurate. His own words always seem to come back to bite him. From his claims that climate scientists are "not that bright" and that AGW is a religion, now he will have to face the facts that his own theories are not the biblical foundation of atmospheric sciences as he has claimed for over 40 years. I always find it amazing that the Singers and Lindzens of the world can be world experts on tobacco, HFCs, asbestos, and climate all in the space of a relatively few years. And always, incidentally, coming to the very same conclusions of no significant harms. Every single time. It's almost like their "findings" are pre-ordained or something. No wonder they look down on the rest of us being inhabitants of such an elite world of polymathematical expertise as they are. "Prager" and "university" are probably two words that should not appear together in the same sentence. Ad hominems aside, I commented on the youtube version of the video. It did not take me long to come up with a handfull of counter-points. I got as far as the part where he claims that over the 30 years he taught at MIT the climate changed "remarkably little", immediately followed by a chart of RSS satellite data showing less than 20 years, carefully edited to finish just before the warmest month on that record occurred. Instead they cherry-pick an out of date period spanning less than 2 decades whilst talking about "30 years", hoping that no one will notice. Many won't, alas. Prager U is a relevant discussion. Once upon a time Lindzen published in real journals. I sometimes (rarely) wonder how the scientists who've opted to campaign against science feel about the choice they made. Do they get a bit depressed that their dumb pronouncements and politicking is mocked by people whose opinions they probably once cherished as from esteemed professional colleagues? I mean Richard Lindzen (and Judith Curry) could have retired and enjoyed minor emeritus status as respected scientists. Instead they chose to toss in their life's work and lie down with idiots like "Steve Goddard", Perennially Puzzled Bob Tisdale, the potty peer Christoper "birther" Monckton, dumbo Anthony Watts, bible bashing tea partiers like Ted Cruz, legislators who want to put all climate scientists in jail like Senator James "snowball" Inhofe, and sociopaths like Marc Morano (my personal non-professional diagnosis, not based on any clinical assessment, though I expect it would be the same:D). I think that they have chosen what they think is the side of the vast bulk of uninformed people. It is basically mob rule where fear and ignorance are the prime movers over any carefully evidence based argument. I used to see this behaviour on the school grounds by the bullies who were too stupid to see how stupid they really were. When scientists have to send a letter to "THE TIMES" pointing out their lack of rigor in dealing with the accurate reporting of the science of Global Warming we have to doubt ANY main stream media reporting on any subject! There's a bunch of people over at cliscep dot com who seem to think the main thing wrong with the video is the grouping. I don't know. I just wonder if there are financial incentives involved. Like retainers to produce a certain amount of scripted op-eds. Like your climate prediction business receiving "work" from certain customers. It's almost as if you're surprised by their response? Actually, since we're discussing Lindzen's video, Barry Bickmore has a good post about it. "Actually, since we're discussing Lindzen's video, Barry Bickmore has a good post about it." Transient changes in insolation of +/- 1W/m^2 are normal.While short term variations have little effect, a long term imbalance on the same scale is significant. Over the long term a sustained 1W/m^2 imbalance is enough to produce 1C/century of warming. That is what we observe. 1 W/M2 of lower solar output translates to -0.25 W/m2 for the earth itself. Agree Entropic man, the effect of a blip in the sun is transient. Some incoming solar radiation hitting the top of the atmosphere is also reflected back out before it gets to the surface (as Marco pointed out). Even if there were a grand minimum, it would only delay the ongoing warming from GHGs for a short period. Or McKitrick's discovery that 1 radian ≠ 1 degree. When I emailed the author of the most recent "ice age" paper/press release (who was a mathematician) they did not understand why I had divided their estimate for the change in solar flux at 1AU, by 4. Not only that, they then repeated their incorrect value later on a radio show. Funny thing... I've been glancing at SORCE data for several years now, and was curious about several deep transient drops in TSI. But my first response was to look at archived solar imagery for the dates in question, see that unusually large sunspots were present, then learn from solar physicists discussing them that some large sunspots are not accompanied by equally large faculae, thereby slightly reducing TSI and going against the general rule that increased solar activity = increased TSI. But then I'm not a 'skeptic' trying to muddy the waters on anything related to climate science. I dunno. 1 w/m^2 delta from 1360... we're all gonna diiiiieeeeee!!! That's the only rational conclusion, surely. Well, if you're an authoritarian. Maybe. Or perhaps not. You know. Uncertainty and all that considered. Weather's pretty good today. Hey, did you remember to take your medication? Oops. That wan't really meant to hang off Magma's comment, but rather in the main thread. No worries. It looks fine where it is. Some corals have been shown to have the capacity to switch their hosted types of zooxanthellæ symbionts after a bleaching event but as far as I am aware to date there is no evidence for this being a significantly-occurring phenomenon in the field, which likely indicates that there is a barrier to or a penalty for such switching. Marine biologists are certainly searching for resistant species, but the results have been underwhelming to date. There is also the possibility of selecting coral clones that are more resistant to the oxidative stress that occurs when their zooxanthellæ symbionts are damaged by heat, as Ruth Gates is admirably attempting to do in Hawaii, , and as Stephen Palumbi is investigating at Stanford , but there are a number of issues with this approach too. First, while some individuals of some species might have a greater resistance to oxygen radicals generated by the dying and disintegrating Symbiodinium (Palumbi’s identification of increased HSP supports this thesis), such resistance doesn’t help the Symbiodinium themselves in the first place, and corals still need their zooxanthellæ symbionts over the long term. And there’s no work to suggest that “heat resistant” corals as have been identified over short spans of time could survive in a world that was permanently warmed. Also, there’s no such thing as a free lunch, and the enhanced resistance to degrading zooxanthellæ may have a physiological penalty elsewhere in coral’s biology. Further, selecting for heat resistance will effectively push coral species through a genetic bottleneck, and if one needs to see the effect of such one only needs to consider the current plight of the Tasmanian devil. Essentially there are two issues - 1) developing heat resistant zooxanthellæ, whilst 2) simultaneously developing zooxanthellæ that are functional within the appropriate host coral species and in an appropriate ecophysiological milieu. Sounds simple but there are a lot of ecological and biochemical skittles that need to line up at once for it to happen. And given that ocean acidification and extreme weather events will increase with further carbon emissions, on top of other forms of human pollution of the marine environment, such as agricultural/urban run-off, there is a huge assault with which the reef ecosystem must deal, and that is almost certainly beyond the adaptability of most species. The fundamental point underlying all this is that humanity keeps treating these issues as technological challenges to be instigated in a reactive fashion, rather than as a management issue to be implemented in a proactive, preventative manner. In other words, our response is to continue manifesting the problem and to try to solve the manifestations of the consequences, rather than to cease with the manifestation of the causal problem itself. The simplest and most effective solution would be to stop heating the planet in the first place, and this would solve a huge number of other issues at the same time and lead to a very great overall benefit to cost ratio, but to date humanity's leaders have shown a singular reluctance to do so. The resultant price is that we've already effectively consigned most of the giant reef systems of the world to inevitable extinction. That we're still fiddling whilst Rome burns seems to indicate that we're not yet interested in salvaging what we can of coral reef ecology, and that we're still blithely uninterested in the other ecosystems and ecosystem functions that will follow the reefs of the world into oblivion. If we delay a serious response for too much longer we'll simply follow in our own (not too long) time these other species/systems to extinction. Thank you for your persistence in producing such a fine explanation, in two parts, of how damaging our actions are proving to be and the limits of Lomborg style techno-fixes, well worth the effort. Many of us of course are already on this page but your effort now provides a useful marker to link to. Happy Earth Day! May today's events signal the turning of a new leaf. Light reading: Tom Harris on the death of coal, governments draining reservoirs, and Hitler (naturally). Seriously, who pays Tom Harris to write this kind of drivel? I've seen his pieces pop up in the oddest places, little daily or weekly papers across the U.S. I can understand Heartland being happy to pay for an opinion piece in the Wall Street Journal, but the Brooklyn Eagle, Harlan Daily or Williamson Daily News? I'm sure Williamson, West Virginia (population 3,090) is a fine place to visit, but why would Harris spend even an hour writing a guest column that might be read by a couple of hundred people if he was lucky? I have been stunned at the sheer amount of disinformation that is being pumped out perhaps the worst one i saw was grapes growing in Antarctica during the medieval warm period. I must make note Sou did comment on the sheer stupidity of the whole episode however how to cut through and point out the problem in the education of people to me is the base cause of this delusional thinking. Various reports are talking about 50-80,000 people evacuated due to wild fires in Northern Alberta, with fires reaching the downtown area of Fort McMurray (famous as the city that services the tar sands) and largely destroying a couple of neighbourhoods; an evacuation centre set up to house people from the outskirts itself had to be evacuated. The current estimate is 1600 structures destroyed. The fires are still not under control. The weather for the past week has been very hot -- 15C above normal, records on many days -- and dry. Most of Alberta is in extreme fire danger. It's not unusual to have large wildfires in the area, but usually it's much later in the year.